Cate: Please welcome author Jeff Gonsalves. Jeff, will you please share a short bio with us? Jeff: Thank you for having me as a guest, Cate. I strongly believe a person is defined by his/her interests. The psycho-competitor in me loves playing basketball, the introspective part of me loves to draw and write, and the little kid in me enjoys playing video games with my nephews and niece. I’ve worked for five years in a psychiatric center, and currently work on a pediatric ward in a large Sacramento hospital. I mainly treat kids with cancer and acute illnesses. Working in the medical field for half my life has awakened an intense love for the human body and healing, whether it be physical wounds or psychological scars. Cate: Tell us about Fork in the Road to Apocalypse and where it's available. Jeff: My newest book is available on the Wild Child Publishing website and through Amazon.com as an ebook (Kindle edition). It’s a science fiction novel about humans with mutations and psychic abilities who are detained by the government and classified as dangerous or harmless. This may resemble X-Men, but the humans in the story are not superheroes. They’re normal people who are on the brink of mental illness or suicide. Their mutations help them cope with overwhelming stress. The psychic abilities they possess don’t involve controlling weather or shooting laser beams from their eyeballs, but are more subtle--e.g., creating elaborate hallucinations or confusing the senses so an entire room appears upside-down. Cate: Fascinating. Please tantalize us with a story blurb or excerpt. 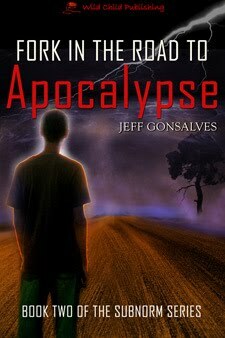 Fork in the Road to Apocalypse focuses on Elliott Anderssen, a disturbed boy with a dangerous psychic talent. His mother worries that he can make a victim’s worst fears materialize in times of stress, so she keeps in locked in her house for days at a time. In a fit of desperation, Elliott transforms her home into a fiery vision from Hell, drawing the government’s attention. A frantic chase results in the crippling of federal agents and detainment of Elliott in a maximum-security seclusion tank. Elliott’s uncle Chuck is an operative working for the Genetics Bureau, the agency that has subdued his nephew. His job is to interrogate mutants to see if they possess lethal psychic abilities. When Elliott is imprisoned, Chuck embarks on a moral roller-coaster ride, uncertain whether to protect his nephew or society. In the end, the government decides to evaluate Elliott for use in military combat. Depressed, but with a strong will to service, Elliott resists the hands twisting him into a puppet. He is reeling on the brink of despair when his uncle forms a band of renegade soldiers (under the leadership of a psychopath named Joey Mallory) to smuggle Elliott out of the Genetics Bureau. After a tragic escape attempt, Chuck and a group of aberrants board a skim-cruiser headed into an uncharted wasteland. Pursued by the military, an android stalker, and a vengeful government agent named Jerry Grouse, their only hope is to reach a leper colony that may not exist. Assaulted by acid rain, bizarre creatures, and a growing sense of dread, the band edges into the unknown. But the external threat is undermined by tension within the group of outcasts. Shadowing every victory is the suspicion that Elliott cannot control his psychic ability, and is unconsciously using it against the people he loves the most. Cate: Sounds intriguing. Can you tell us why we're going to love your hero? Jeff: I purposely made Elliott edgy and frightening. I didn’t want him to be a typical “cuddly kid”. He has problems that would challenge most adults. Still, Elliott has a kind heart. He is socially inept because his mother (who is bipolar) keeps him locked in the house all day. He tries to be a good boy, but repressed anger makes him lash out. Like most ten year-olds, he is resilient and has a strong desire to please adults, but he is also tormented by the notion that he can’t control his psychic ability and might hurt others. In the end, all he wants is to be a normal kid without the crushing stress of being an “aberrant“. His journey parallels that of many kids diagnosed with cancer who can’t escape the clutches of a life-threatening disease. Jeff: I’m working on a seventh book in the Subnorm series. Each book can stand alone. I’m actively promoting Apocalypse and preparing my other books for publication. I’m also sponsoring a child with cancer/chronic illness every month on my website. All profits made from book sales are donated to the child’s family to help with medical expenses. A guilty pleasure of mine is creating novel trailers and posting them on YouTube. My most recent fleshes out Elliott’s character via diary pages seized by the government as evidence that he has a dangerous psychic ability. Jeff: An author at the hospital told me that I should write a non-fiction book about the kids I work with. He said that there was something inherently tragic in seeing “bald-headed kids walking down the halls pushing IV poles“. In truth, these kids are amazing survivors who just want to have fun and don’t let their illnesses strap them to a bed. Most kids are so energetic they’ll run sprints down the hall after receiving three days of chemotherapy. Somehow, their systems are hard-wired to bypass side-effects that would cripple most adults. When I drafted Apocalypse, I didn’t realize I was subconsciously channeling the story of children fighting a grueling illness. Only after completing the book did I understand that it was my way of coming to terms with seeing affectionate kids suffering or failing treatment that was supposed to save their lives. Cate: Very cool. Do you have a writing routine? Jeff: I write sporadically. Having a full-time job and other obligations makes it difficult to follow a strict schedule. I usually write a couple hours a day three times a week. This allows me to finish a book in a year or two. I’m obsessive about detail and making sure every scene is unique and never boring. Jeff: I’d love to know what they like or dislike about my books. I believe even the most brutal criticism has merit. Hearing different opinions is what helps an author grow. Cate: Readers, Jeff Gonsalves is giving away a book to a random commenter... so start commenting. He'll pick a winner on the evening of December 14th, 2010. Thanks so much for being my guest Jeff! Best of luck to you. Where is Subnorm Book 1? Or is that one of the others coming up. Wow seven in the series already written! Best of luck Jeff. Sounds like an interesting concept. I love the sound of this book. I hope I get my Kindle for Christmas to buy it on. Thank you, Marva and Susan! My first book, "The Subnorms" was published in 2001 via Trans-Atlantic Publications in hardback form. It's now available mainly online, at sites like Amazon.com and Borders.com. Thank you very much for your comments and I'd love to hear your opinions of the book. This is a wonderful interview, Jeff. The background brings new meaning to your book. I do not know how you can work where you do and stay sane. Watching those kids struggle would be very, very hard for me. Bless you! Susan, Kindles are on sale at Kohl's (if you can get there early enough) for $99. It opens 3 am Friday morning. Insane, huh? !